The internet has changed the way we live our daily lives, there is no question about that. One of the things it has changed is how we access information (it's not the library anymore) and how we shop. So whether someone is looking for information about a product or service or whether they are looking to buy a product, they will invariably go online. 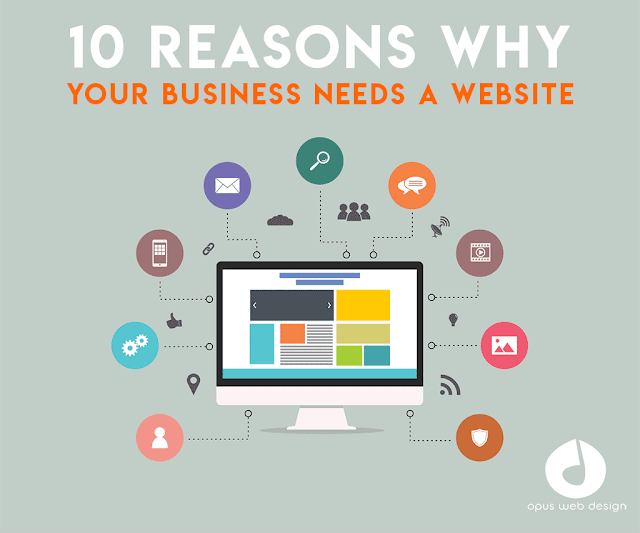 With that in mind here's our top 10 reasons your business needs a website. 1. The Internet Is The New Phone Book. Remember back in the olden days, when someone wanted to know something about your business, and they hauled a massive book out of the closet that was the size of five bricks and looked up your business? Yeah, those days are over. Nowadays, one of the biggest business website benefits is that the internet acts like a phone book - and then some. Because they're not just finding your business online, they're also finding reviews by customers but also comparable products and services (i.e. your competitors). So instead of letting potential customers find your competitors, get them to find you by having a website. A 2015 study performed by Verisign reported that 84% consumers believe that small businesses with websites are more credible than ones without an online presence. So your customers expect a website. Six out of ten of them, in fact, expect brands and companies to provide online content about their business in some form or another. Giving them what they want in a website is just as much an art as giving them the product they want. And while we're on the subject, most of them will go straight to your website for information about you and your products. And if they don't find it... they'll find a competitor instead. A website also gives you the opportunity to prove your credibility. You have to tell your customers why you deserve their trust through your website. This can earn positive feedback for your service and products. Also, your website serves as a place for a potential investor to explore what your business is about and what it can do in the future. So instead of hoping for good things on Yelp, why not let them read reviews on your website, where they're already more likely to buy? They've already found you, and they're more likely to be willing to buy if they see positive reviews while the product is right in front of them. You might be thinking your small business can't afford an expensive web development, right? It's out of your budget. Maybe next year. Wrong. The cost of building a site varies but Opus Web Design can work within all budgets. Think about this.Your brick-and-mortar business has operating hours. Because, you know, people have families, and lives, and working hours. They work, leave, and go home. So your brick-and-mortar business can only earn money while the doors are open for business. A website on the other hand never stops running. A customer can find you from across the world, or in the middle of the night A website can have an impact on their buying decisions even if you're fast asleep. Customers have access to your business 24/7 even though your business isn't up and running 24/7. You can literally earn money while you sleep. You can't control what other people say about you, or what they post about you on social media, but through your website you can control the story you give them to start with . When people search your business online your website should be the first thing they see and therefore you get to make a good first impression. On top of this, a website blog gives you an easy platform to give useful information to your customers on a regular basis, and your email list lets you market them, at a low cost, straight to their inbox. Oh, and that thing about what they post about you on social media? You can't control what everyone posts about you, but you can give them the option to share your products and content with social share buttons. Control that narrative, all day, every day. Picture this. A consumer has an idea about what they need or want. Before they buy, they fire up a search browser and start typing. They go through websites to research what they want. 72% of them go online for educational material, expert tips, reviews, and testimonials. Now let's say they find what they need/want, they learn something, find out something new about what they were looking for, and because that expert material was so darn helpful, they decide they like this company and they're going to buy from them now - through their website. Except, oops, it's your competitor, because you don't have a website and they didn't find you because you don't have a website. So basically, you're taking yourself out of the competition before the competition even started and hoping you have the good luck of a customer finding you on the street. Have you ever advertised your business through various forms such as printed media, radio, television or by other means? It can be expensive investing in advertising, right? It is necessary, but it can cost a lot of money. Having a website will make promoting your company less expensive. We already know that most people go online looking for product/service information before they buy so make sure they find you with a high ranking, search engine optimised website. A website with good SEO is a major advantage for your business. There are also lots of ways to advertise your products or services through the internet. Social Media ad campaigns are one of the best, but you need to have a website to direct people to if they decide to click on an online ad. Links are very important to viral marketing. If you have many sites linking to you, it is like spreading the word about your company all around the world. If you have a good website with good content related to information, products or services, people are more likely to link your website to theirs. This means they recognize your website as valuable. A website is also more environmental friendly when it comes to advertising and marketing. Having a website can also help you build better relationships with your customers. You can send messages instantly to your customers through email, your customers can review your products online and can also leave feedback for you and your business. This is essential for building a good relationship with them. Having a website will be more convenient for your customers making it easy for your customers to purchase from you. Many will be more likely to visit your website, rather than driving a car to your physical location and browsing for your products. From a customer’s point of view, it’s better for them if they don’t have to ask anything. They can just find what they’re looking for on your business website. Have you ever experienced having to turn customers away because it’s closing time? Well, you don’t have to close the doors of your website. An online site can be visited any time of the day or night. People will look to your site instead of going to your shop because it is more accessible. Just make sure to post plenty of information about your products and services and have a FAQs section where you can answer customer questions before they even ask them. And a website also means accessibility for you as a business owner. Did you know that if you own a website, you can actually track everything that is happening on it? You can get information that will tell you how many people visited your site, where they are from, what products they looked at or how long they stayed on your website. Access to this type of data can be key in identifying your most popular products or which ads created the most leads or conversions. If you now realise that your business needs a website or even if you have an existing website that isn't performing contact Opus Web Design now for your free website consultation.